Dotty Bingo claim to be the friendliest UK online bingo site with awesome bingo and a warm community waiting to welcome you. 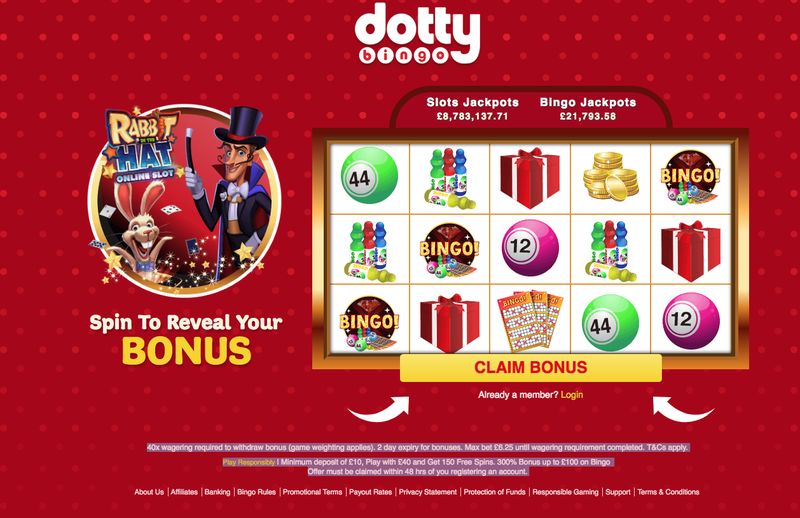 Dotty Bingo opened its doors back in June 2011 and runs on Microgaming software. Ever since Dotty Bingo made its debut, it has been one of the friendliest and most popular online bingo sites to play at. This is where you will be able to play awesome bingo as well as entertaining mini games online. Dotty has a combination of excellent game selection with a warm community, wide range of promotions and a welcome bonus, top-notch security and 24-7 player support. You will find a great selection of 90 ball, 75 ball and speed bingo including free bingo which is played daily. All bingo tickets are competitively priced, so even those on a tight budget can play here. You can pre-buy ticket so you don’t have to break the bank, An array of slots awaits you, titles include: Thunder Struck II, Cashapillar and Mermaids Millions. The games at Dotty Bingo are powered by the popular Microgaming software, and there's no download required. Deposits and withdrawals are simple here, just follow the easy to read onscreen instructions. Payment methods accepted are: Paysafecard, Mastercard, Visa, Visa Debit, Visa Electron, Maestro, Solo, Diners Club International, Skrill, Neteller, Ukash and Entropay. This bingo website uses sophisticated encryption technology to ensure that all players information is made safe and secure. The bingo lobby is just as dotty with bright graphics and plenty of bingo rooms for you to choose from, choosing may be a difficult task. Thankfully the dotty theme ends in the lobby and the bingo rooms are lovely and colourful with plenty happening. This bingo site is user-friendly and features lots of friendly chat hosts and players in every bingo room. Lots of chat and plenty of jackpots being played at Dotty Bingo, if you want to know the latest promotions just head to the promotions tab in the lobby. The only thing that isn't dotty here are the players. Dotty Bingo is licensed in Malta.